- This episode marks Rowena MacLeod's 30th appearance on Supernatural. She is the second most recurring female character on the series, behind Mary Winchester (34 episodes). - The Jackifer manifestation is similar to Sam's Lucifer hallucinations throughout season 7 after Castiel broke the wall in his mind. 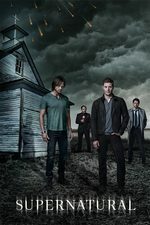 - The show's tradition of killing off a recurring character 3 episodes before the season finale continues as Mary Winchester's death is confirmed in this episode. - In the flashback scene between Mary and Cas, Mary speaks as if it is just after Amara bought her back. We only know of her taking one hunt (during the events of 12.03 The Foundry), before she left the Bunker and Cas and the Winchesters to have some space for herself. Writer Robert Berens confirmed that this was deliberate. - While in the present Castiel continues to drive the newer, more modern truck first seen in 14.07 Unhuman Nature, his old truck from season 12 is seen in the flashback to his hunt with Mary. This is the first time that truck has been seen since it was abandoned outside of Kelly's cabin in 13.01 Lost and Found following Castiel's death. - Mary is confirmed to be at peace in a special Heaven with John Winchester, confirming for the first time that John made it to Heaven after escaping from Hell. While only Mary's name is listed on the door to her Heaven (with her two death dates 1954-1983 and 2016-2019), in 5.16 Dark Side of the Moon, Ash described that while most people had individual Heavens but some "special cases" like soul-mates shared a Heaven, which may be the case for Mary and John. Duma does describe Mary's Heaven as a "special Heaven" and says that Mary is complete. -- Nepal is the location of the fictional land of Shangri-La where people lived for hundreds of years. -- Peru is where the psychedelic brew Ayahuasca is made and used in spiritual and other healing ceremonies. -- Jack may have stopped in Paris after visiting Lourdes in France, a place many Roman Catholics visit to take in water they believe has miraculous healing powers, due to reported appearances of the Virgin Mary. -- In Madagascar, traditional healers work closely with the spirit world. I'm actually surprised they didn't consider time travel, even though the dialog hinted at the idea. I never got the impression that they were that adamantly against it, just not wanting to do too much damage. A recent enough time travel shouldn't affect too much. When Rowena said that Mary was "no longer on this Earth", did anyone else think this was implying that Jack had sent her off to an alternate universe or something? Obviously it's been confirmed that this is not the case. I actually really liked this episode. Unfortunately, I never really warmed up to Mary's character when she was brought back, so I wasn't really sad about her dying, but this episode was still a good tribute to her. I'm actually surprised that Mary has been in more episodes than Rowena, because Rowena has felt much more present in the show, although maybe that has to do with her being on the show for a longer stretch of time, even if it's fewer episodes. I totally did not expect Jack to kill Mary. I thought it would turn out that what was bothering Jack at the end of the last episode was not Mary talking but Lucifer coming back. I thought maybe he would possess Mary (though I'm not sure how he could get permission) or Jack. I really didn't want them to kill her off. I'm hoping she won't be permanently dead but I'm afraid she might be. This was a good episode, though. Can Jack get his soul back? Or maybe learn to be good without one, like Cas? Can Sam and Dean ever forgive him? Can Dean forgive Cas? Watching that all play out should be interesting. But maybe they'll stick with this season's theme of having the biggest bad things fizzle out in surprise anticlimaxes and everything will just get fixed next time. I just clicked on the Samantha Smith farewell tweet. That really does sound like she's gone for good. Darn. I feel like making Jack kill Mary was a mistake. Jack is sweet and lovable and we want Sam and Dean to forgive him and love him again eventually, once he's dealt with his soullessness. But could they ever really forgive someone who killed their mother, even if they knew it wasn't his fault? That seems beyond what could be expected of any normal person. But it would be incredibly depressing to see Jack permanently estranged from the Winchesters. My idea for Jack is that he should become the new God. He'll realize he has enough power to give himself a soul or he'll figure out another path to goodness and he'll take over for Chuck. Or maybe he'll bring Chuck back and Chuck will stay around just long enough to fix Jack and delegate responsibility for Earth to him. Once Jack is in charge, he can start work on the long, slow process of turning Earth into a paradise. We'll be left feeling like Cas's vision will probably come true someday but in the short term things will be much the same, with plenty of work left for Sam and Dean. Yeah, I really wasn't expecting Mary to be actually dead, but they did a lot to drive home just how dead she is so I guess it's for real. The character never quite gelled and I suspect the writers were kind of straining to come up with stuff for her to do, but it's still sad to see her go. Jack is getting genuinely scary but at this point he still seems more distraught and confused than bad. Maybe the Lucifer in his head is right and Jack's guilt is just a reflex, but it sure doesn't seem like it. If Jack did lose his soul it seems to have made him more emotional somehow, he's really scared and volatile. I wonder if the Lucifer Jack sees isn't just in Jack's head, and the old rascal got just enough of a foothold in this world to speak to Jack. It wouldn't surprise me if he's sneakily trying to turn Jack evil so they can rule the universe together. I was awfully fond of Mary, and I wish her death hadn't been so random and meaningless. But especially towards the end with the montage, it felt weirdly...hollow? Like yeah everybody seemed kind of sad, but the show was still relying on super perfunctory camera work and dramatic music to do a LOT of the heavy lifting and it was not really working out. I wonder if the fact that the montage felt so clumsy was that they never quite figured out how to use her, even though I think she was a great character and, not for nothing, this show didn't need another murdered woman on the books to move the men-folks' plot along. I wasn't watching the snake-disintegration scene close enough to realize before now that Castiel actually saw the whole thing. (While Castiel is clearing the air, he should probably mention how Mr. Inky is going to pop up and murder him at some point. So hey, Sam and Dean will never see their parents again, but the three of them will have a dope billion year slumber party in the Empty someday.) I actually sort of liked that while Dean really needed to be mad and was gonna be mad at Castiel for a while, he and Sam could also have a relatively clear-eyed discussion about the warning signs they'd also overlooked, and how badly they wanted things to magically work out. Also, Dean will probably eventually be happy to get his necklace back, but there was suuuuper not a good time at any point here for Castiel to mention it. I wish we'd seen some indication Castiel was taking Mary's own wishes into consideration even a little (Sam and Dean too, sure, but we already know letting their family members stay dead is not among their talents.) But I suspect that 1) alive human vs. dead human is a slightly academic distinction to an angel, even if they can understand that to the other humans it matters a lot. Seeing someone who died painlessly and is in perfect joy, it could feel pretty lousy to drag them out of it for what Castiel understood were basically selfish reasons. (Or so we must assume, since again we never find out what Mary thinks of any of this.) Also, I suspect the writers wanted to write Mary out but didn't want to show her choosing to stay dead, even though ever since she came back she's seemed like somebody with one foot in the next world. I also thought it was interesting that, in effect, they're choosing to do for Mary what they've never done with each other, which is leave her in peace. " Well, I think Sam and Dean are always kind of a special case. It's sort of a running joke at this point that they have this seriously codependent dysfunctional relationship. Dean does more of this than Sam (like selling his soul to bring Sam back, letting Sam be taken as a vessel by some random angel), but just look at one Sam was willing to do when Dean had the Mark of Cain. And they've even had conversations about how bringing the other person back isn't for that person's benefit. Dean outright admitted he sold his soul not for Sam's sake, but for Dean's. Dean was willing to let Death send him off to some random planet, but he couldn't handle doing that to Sam. But they aren't going to have that same codependence with Mary, because Mary was gone for pretty much their entire lives. And even since coming back, she's still been far more absent than present. Also, it was made pretty explicit that she really struggled with being taken from heaven and brought back to Earth. That wasn't her wish; it was Dean's wish fulfilled by Amara. So I can see why they would decide it was better just to leave her in peace. Going back to the Lucifer thing, it feels like they already have plenty to deal with in the final season without bringing Lucifer into the equation. They haven't said anything about Castiel's deal with the Empty, but presumably that has to be dealt with. Although the whole sacrificing himself to save Jack thing is probably going to go over really badly right this second. And then I have to assume they are going to need to deal with the fact that heaven is falling apart at the seams. Both of those things all by themselves seem like they should be enough to deal with. Then again, I suppose if you bring back Chuck, the issue of what to do with heaven could probably be dealt with pretty quickly. Speaking of Chuck, I actually think it would be pretty cool if they ended up having both Chuck and Amara return to rule over in heaven together. Or, since Chuck doesn't seem to have much interest in that, maybe now that Amara and Chuck have presumably buried the hatchet, perhaps just Amara wants to be in charge of the day to day stuff, and Chuck can go off and write more books. Yeah, I think it's likely the series finale will involve Chuck and/or Amara. I also think it's almost inevitable Lucifer will be a big player in the final season. He's been such a major player in the series, it would feel weird if he wasn't the final big bad. I like Pelligrino as an actor and I think he does well with whatever they give him, it's the writing of Lucifer that's inconsistent. He often seems more mischievous or self-pitying than evil and scary. But if they want to make him really scary in the final season, I think the potential is there. As for why the boys are letting Mary stay dead, I think it's one of those deaths where the writers have decided a character needs to be dead for narrative reasons so the characters don't do everything they could to change it. It's just one of those things you have to accept in genre stories sometimes, that even when death is fixable, it doesn't always get fixed. The Deep Space Nine episode Duet ends (spoiler) with one of the all-time great Star Trek deaths, but the guy just gets stabbed with a knife and he could totally be saved with Trek tech if everybody wasn't just standing around watching him bleed out. But if we want that classic ending, everybody has to forget about the sick bay a few doors down. As for Lucifer choosing Nick for a vessel, it seems like the demons and angels just have vessels they like to stick with. Castiel seems to feel really at home with Jimmy's body, for example, and Lucifer seems to think of Nick as his default. It also helps to make a character feel consistent when the same actor plays them. They've mixed it up with all the Megs, and the season where Lucifer was Rick Springfield for a while, and while that can be fun it does kind of make it seem like a new character. It's striking how Rowena is so firmly in camp Good Guy now. She's come a long way from the days when she was frying people alive without showing any signs of guilt! P.S., I've been carrying the Where Is John Winchester torch since 2007 and "oh he's in Mary's special heaven" is more boring than either of them deserve. Mary just died (again) last week, so if she and John been sharing a heaven since '07, where has John been for the past few years? Sharing that same heaven with a replica? I don't really mind the idea of Mary and John sharing a heaven, soulmate-style, but I find the timing strange because they haven't both been dead at the same time for that long. I thought this episode was pretty well done, but it also rang a little hollow. Jack's storyline was the most compelling part of the whole episode, and you'd think it would have been Sam and Dean's storyline instead? But Sam and Dean weirdly didn't take Mary's death that hard. I mean, I actually think it would make sense for them to not take it THAT hard, because she was only alive for like three years while they were in their late thirties, it's not like they grew up with her or had a normal parent/child relationship with her, and they didn't even spend time with her that much. But I guess my point isn't that they should have been rending their garments or whatever, it's just that their emotions generally didn't ring true. The soapy music and camerawork didn't help, though. That soapiness just drew attention to how hard the show was trying to ring emotion out of scenes that weren't really that affecting on their own. Anyway, I actually like this desperate and clammy version of Jack pretty well. What's going on with him? Why was he getting that headache and freaking out at Mary at the end of last episode, anyway? I feel like maybe Lucifer actually is possessing him at least partly (somehow), because at that last scene in the previous episode, the show kinda/sorta did that loud ringing sound like they used to use for Castiel when he wasn't fully in a host. And also because the Lucifer vision that was supposedly a figment of Jack's imagination didn't really seem that imaginary? I thought it was pretty funny how Figment!Lucifer told Jack that he was just a part of Jack talking to himself, and Jack was like, "doesn't really seem like it?" and the Figment!Lucifer just sort of shrugged like, "OK, got me" and continued on with his BS. I mean, that actually did seem more like Lucifer than Jack. And Jack barely knows Lucifer, so I doubt he would be able to come up with such a faithful copy of him on his own. On the other hand, I am hoping and praying that Lucifer doesn't come back because I find him so tiresome. I'm not sure where the show is going with Jack's storyline, but honestly, I kind of like that. It's the most surprising and ambiguous direction that the show's gone in a while, so it's refreshing in its own way. I really do hope that they don't write Jack out, though. I've really grown to like the kid. I wonder if "special heaven" will eventually be revealed to mean more than just "Mary and John are together." Like maybe Mary has the ability to observe Sam and Dean or even communicate with them. Maybe she's been given more awareness of where she actually is than most souls in heaven and maybe she and John have been briefed on the precarious angel power situation and given instructions about how to preserve or evacuate all the souls if the lights go out permanently. Yeah, for a moment there when she was describing to Jack just how very much power this necromancy spell was going to require, I wondered if maybe she had seen an opportunity to harness a Nephilim to use as a battery for her own purposes....but nope. Apparently she's really gone legit. I still kind of get the sense that she's more like a currently-sober alcoholic than a true "good guy" - like she's still just one really bad day away from going full person-frying-nasty again. Also she's basically immortal. I'm sure the writers aren't thinking this way, but honestly, if you were an ageless witch (or vampire or demigod or any other critter capable of living for centuries) who had repeatedly had close calls as a result of attracting the attention of the Winchesters, I feel like the smart play is absolutely to make nice with the Winchesters for, you know, a trivial couple of decades or so until something else finally kills them off and then you can just go back to doing your thing without all the worry. In my headcanon at least, Rowena did that math and figures that playing nice with Sam and Dean for the brief span of time that is "the rest of their lives" is safer than fighting them and also an occasionally amusing diversion while she studies that book and makes big plans for her post-Winchester existence. Rowena knows Sam is fated to kill her, though. If anything it would seem like it'd be in her best interest to try and kill Sam before he can kill her, but instead she's helping the Winchesters. I think her turn to the good side is legit, although I wouldn't rule out her going bad before the show is over. I'd be willing to bet we'll see Mark Sheppard again sometime in the final season, even if it's only a "flashback" or an alt-Crowley or something. My money's on alt-Crowley, but the twist is that it's a different human, and alt-Fergus MacLeod is actually an angel. Rowena's basically been acting like she's invincible since she knows she'll get killed by Sam, but chances are she's buttering up to the boys so it won't happen, because she knows that with the way things go, if she takes the first strike, she'll fail and she'll really get killed by Sam. Sam is so hapless, I can see him ultimately killing Rowena in some bizarre Final Destination-style accident.